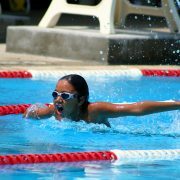 We fast every day. Hence the word, breakfast. Whether you break your fast at 7 or 11 AM, it may be good to track the amount of time between dinner and breakfast. The Journal of American Medical Association (JAMA) published a study involving 2413 women diagnosed with breast cancer. Data shows the mean fasting time (time between dinner and breakfast) averaged 12.5 hours. 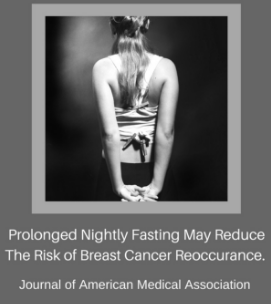 Fasting less than 13 hours increases chances of cancer re-occurrence by 36%. 36%! A simple change like eating one day’s ration of food within a 10-11 hour period could reduce chances of cancer by 36%. That’s eye opening. Not to mention, 13 hour fasting reduced HbA1c (diabetic marker) and increased nighttime sleep. What does this mean for those who haven’t been diagnosed with breast cancer? Studies involving mice and humans have also shown positive effects. Patients with relapsing remitting Multiple Sclerosis (MS) followed prolonged fasting and ketogenic diets. The article cited “clinically meaningful improvement” on MS Quality of Life- 54 scores. Mice showed improvement of MS symptoms by undergoing a fasting mimicking diet. The diet lowered the number of damaging immune cells and regrow the myelin sheath. The myelin sheath is the protective covering for nerve communication. The sheath is similar to the plastic covering of a power cord. These studies have sparked larger clinical trials looking into an array of health issues that can be improved by fasting. I believe these studies are fascinating given the ease of application and the potential health benefits. Can you eat all of your calories within a 10 hour time frame? Definitely. Why do these trials show so much promise? Scientist hypothesize that cells under a fasting state will undergo cellular protection or death. Cells that are abnormal/damaged are more apt for death in a fasting state. Therefore a cellular reduction from apoptosis (cellular death), will stimulate stem cells (parent cells) to make new healthy cells. With modern day food science, calories are plentiful. Maybe we need to take a longer break for our body to metabolize calories. It’s seems reasonable because a constant or excessive feeding of our cells is unhealthy. In conclusion if you plan to change your diet, please consult your physician especially if you have a preexisting condition. Exercise or Diet to Maintain Weight?